From the frozen plains of the far north, a brand new mount is stampeding its way to Magerealm! 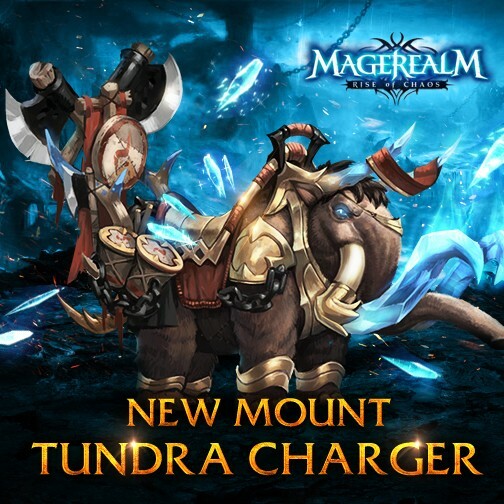 Introducing Tundra Charger, a beast of truly mammoth proportions! The mages sent north have returned after taming one of the greatest beasts in the region. Many never made it back, but their valiant efforts have brought a powerful addition to the Mage Council’s forces. The hardened crystalline tusks of the Tundra Charger can smash through nearly any defense. Combined with their massive bulk, Tundra Chargers are an unstoppable force once they start rampaging. Those caught in their path have two choices, get out of the way or be crushed in a most gruesome death. Are you excited to ride this wooly behemoth into the fray? Follow Magerealm on Facebook and visit the official forums to get the latest news and participate in rewarding events. Come experience an epic fantasy world of magic in this free to play action MMORPG!